From her desk overlooking downtown Flint, Kathi Horton has watched millions of dollars flood into her beleaguered city. One fund run by the Community Foundation of Flint, where Horton is president, has had 15,000 donations so far this year. A few blocks south on Saginaw Street, Michael McDaniel is in charge of a program called “FAST Start,” with the aim of replacing all lead service lines in the city in one year. Despite its name, only 33 homes have had the work done since the program’s February launch. The former brigadier general of the Michigan National Guard describes a bogged-down infrastructure repair program hamstrung by lack of money and manpower. Eight months after President Obama issued a federal emergency declaration, inspiration and impatience walk hand-in-hand in Flint. In the past year, more than a half billion dollars in bottled water and filters, donations and government assistance has reached or been committed to Flint to help address the water crisis. Aid worth millions of dollars came to the city in truckloads of bottled water. The Federal Emergency Management Agency provided 9.3 million liters of water and 50,000 water filters. Walmart, PepsiCo, Nestle and Coca-Cola donated more than 7.2 million bottles. Celebrities Sean Combs, Mark Wahlberg, Cher, rapper The Game, rock group Pearl Jam and Detroit Lions players donated millions more. Conservatively, the value of those donations is at least $5 million. Congress hasn’t approved any general federal aid for Flint. The Department of Health and Human Services provided about $4 million for preschool and health services expansion, as well as Medicaid expansion health services to an additional 15,000 Flint residents. The Medicaid expansion has an estimated value of $180 million over 5 years, and another $27 million in expanded low-income food assistance. The state has given $240 million in direct aid so far, primarily for pipe replacement and water bill reimbursement. That figure doesn’t count the man hours of state employees who have set up residence in Flint to help coordinate recovery efforts. At least $127 million has been committed by some of the nation’s largest philanthropies. The exact figure is tough to determine, because the majority of the money has not been given out in grants or is being parceled out over a span of years. The C.S. Mott Foundation, based in Flint, committed up to $100 million over five years. The Kellogg Foundation recently announced $7.1 million in grants to Flint, and the FlintNOW Foundation, formed by Pistons owner and Flint native Tom Gores, pledged $10 million. Kresge pledged up to $2.5 million. Carnegie, Ford, Hagerman, Robert Wood Johnson and Ruth Mott foundations each have committed $1 million. At least $13.2 million has arrived in individual donations, from families, churches, clubs and companies. The total thus far: Conservatively, $596 million. Flint community leaders believe the response to the water crisis could eventually reach $1 billion. It is the recipient of an unprecedented-for-Michigan commitment of philanthropic largesse, with well over $150 million in government and charitable aid in the city now and at least three times that still on its way. Dozens of public service initiatives have launched or expanded to help city residents, from early childhood education programs to pop-up farmers markets. But beyond the bottled water, progress in Flint is difficult to measure. Few of the pipes that leached lead into the drinking water have been replaced. And the success of efforts to counteract the brain-damaging effects of lead poisoning in Flint’s children won’t be known for years, if ever. It’s difficult to tally the dollars that in the past eight months have poured into Flint, which has been living under a state of emergency since January because of the impact of lead-tainted water. Conservatively, the figure is about $600 million either already in Flint or committed to the recovery efforts in coming years, from sources ranging from government and philanthropies to pop star Beyoncé and kids selling t-shirts. Ten large philanthropic foundations have pledged $122 million, with the Flint-based Charles Stewart Mott Foundation kicking in as much as $100 million over five years. Individual donations, many of them small, have accounted for at least another $10 million. 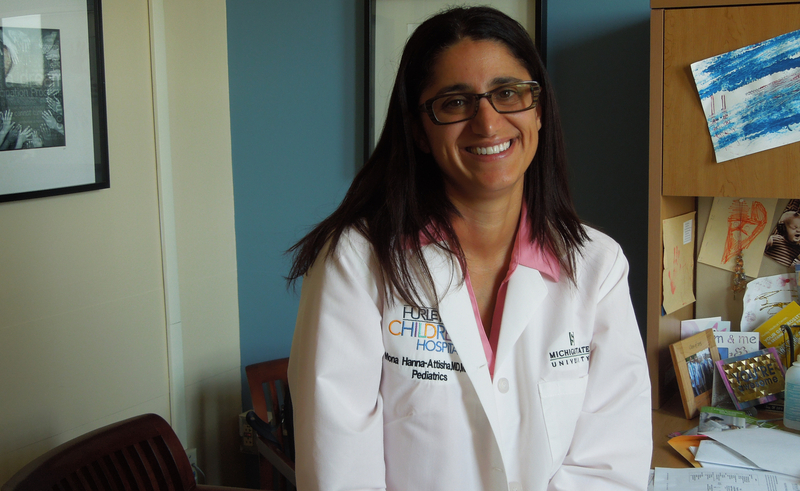 “It just brings me to tears,” said Dr. Mona Hanna-Attisha, the Flint pediatrician who helped expose high levels of lead in Flint children, and who is now the city’s best-known advocate for financial aid. On her desk at Hurley Children’s Hospital are stacks of letters confirming donations and crayon drawings by thankful children. The bulk of the money awarded by foundations and donated by individuals is going to six broad causes: water system safety, health, early education, nonprofit capacity building, community engagement and economic revitalization. Examples can be seen across the city. A program that doubles the value of federal Supplemental Nutrition Assistance Program (SNAP) dollars for low-income families buying fresh food is funded by several foundations. Newborns will get a book delivered to their home each month until they reach age 5. This fall there will be community school directors and health navigators at 11 Flint schools. After-school programs have been expanded. The federal Head Start and state Great Start Readiness programs for children ages 4-5 have both been expanded, along with the Early On program for infants and toddlers. For foundations accustomed to working at a deliberate pace, the money is arriving at lightning speed. Before the water crisis, C.S. Mott had budgeted $25 million in grants in Flint for 2016, but is likely to spend close to $60 million on everything from water filters to a high-quality after-school initiative. The Kellogg Foundation awarded $7.1 million in grants in August, $2 million more than it expected to commit to Flint just three months earlier. The Kellogg grants focus on community engagement and leadership development – things that will pay over the long haul. “We do not believe we are fixing Flint by any stretch of the imagination, nor do we think we can,” said Kellogg President La June Montgomery Tabron. “All of philanthropy can’t put a dent in replacing those pipes.” (Disclosure: Mott and Kellogg are funders to The Center of Michigan, which includes Bridge). The Kresge Foundation has committed $2.5 million, the majority of which has yet to be awarded. A federal waiver that allows about 15,000 more Flint families to qualify for Medicaid benefits will provide about $180 million in health care benefits over five years, and an expansion of food assistance eligibility is worth another $27 million. There are initiatives to increase the rate of breastfeeding, teen employment and college readiness. Community leaders say they believe the dozens of initiatives aimed at thwarting the impact of lead poisoning and strengthening the economic, educational and leadership fabric of Flint will have a huge impact on the city over time. “We’re working on a 20-year timeline,” said Hanna-Attisha. That’s a tough sell for residents who still don’t have safe drinking water. “It’s not like a tornado came through and we need to replace a roof,” Gaskin said. “These things are complicated. You have people who won’t answer the door (to take free water and water filters) because their house doesn’t meet code and they’re afraid of being kicked out. You have a city that is so understaffed that everything takes three or four times as long as it would in other cities. One of the difficult dynamics of Flint recovery efforts is the chasm between lofty philanthropic support and the slow replacement of the city’s lead pipes. Other than $4 million the C.S. Mott Foundation ponied up in the fall of 2015 to help switch the city’s drinking supply from the corrosive Flint River back to the Detroit Water and Sewerage system, little foundation money has been given for water system repairs. “We’ve done the initial things, the things that foundations know how to do,” Mott’s White said. The state has anted up $25 million for pipe replacement. That’s less than half what Branch says the city needs, but could provide a good start. That money is stuck in limbo, however, because the state placed a limit of $5,000 per home on pipe replacement, and Flint’s lowest bid for the work is over $6,000. Flint water czar McDaniel said he hopes to rev up pipe replacement this fall with another pot of $2 million the state gave to Flint with fewer strings attached. Mayor Karen Weaver announced Friday that the city plans to replace service lines for 200 to 250 homes by the end of September. Some of the reason, though, for the slow pace of pipe replacement is that there are too few city employees to get the work done. Foundations have funded one position (water czar McDaniels) for a year, and will pay the salary of public health director beginning in September. But the American city with perhaps the most serious water infrastructure problems doesn’t have a public works director. The city doesn’t have enough people in its human resources department to recruit qualified employees. It lacks the manpower to send out property tax bills in a timely fashion; the latest round were mailed to residents just a week before they were due. “We have to rely on grants to increase capacity, but we don’t have the money to hire a grant writer,” Branch said. The city also doesn’t have the money to hire a lobbyist to push for more recovery funds. “It seems like everyone is waiting to see what the other guy is going to do before they do something,” Branch said. But the story is fading from headlines. And though the pediatrician-hero of Flint is an optimist, she said she knows how hard it will be to keep money flowing into the city that’s needed for recovery. The Community Foundation’s Horton estimates the Flint Child Health and Development fund, the primary general-purpose fund for long-term efforts, needs $100 million over 20 years. Flint Chief of Staff Branch said the city needs $60 million for pipe replacement. More than enough money to make a good start, but too few city employees to do the work, It's a recurring theme. Has anyone thought about subcontracting with companies that are qualified to do the work? Or is the bottle neck the unions? To lower the cost per house, maybe the city should become its own contractor, and hire the necessary personnel to do the water line replacement work in-house. Thank you for this article. It is important to remember the water crisis is still very much a reality for the residents of Flint and we should not let it fade out of the spotlight. As a resident outside of Flint, in addition to donating money, what else can I do to help in the recovery efforts? If the lead levels are dropping (and they are.) to below the acceptable level, why does the city (and some state) politicians, feel compelled to spend huge money changing out all the lines? Never mind we all know the answer - fanning the grievance fire. Is changing the lines really the best option in cases where the lead level is or isn't dropping? Seems that we should try to not get into the just do something, do something mode without careful thought. Flint was on its downward glide path well before the lead issue arose. Will new lines be anything more than painting the deck chairs on the Titanic? Or would we be better finding these people another ship? You're pretty much the worst commenter stereotype on the internet. You barge into a conversation with thinly veiled racist sentiments about Flint or Detroit, and then make snide, snarky jokes about how the hard work that other people are doing is pointless or stupid or some vague "cultural" problem, presumably with the majority black residents of Flint or Detroit. If you're not going to help, if you're not going to encourage or give any constructive ideas, just keep your mouth shut. Stop getting in the way of the people who are actually rolling up their sleeves and doing the hard work it takes to fix America's broken cities. What fix? Certain cities are still broken and always will be until attitudes change. Every day there is something in the news from an investigation going on, to a group not doing their job, to a senseless crime, or a major conviction. Flint can't find a public works director because they budgeted $105,000.00 salary and nobody will take the job for under $150,000.00? How critical is a public works director to getting something done? With all the money pouring into Flint I can't believe that $45,000.00 stops the hiring of a public works director. Offer a qualified super star $300,00.00 to come to Flint and make something happen so the people of Flint don't have to wait 20 years to have a system that most residents of Michigan take for granted.